It's Time to Celebrate Fifty Years of Hands On Hartford! That's right, fifty years! Fifty years of Hands On Hartford helping Hartford. Since its founding as Center City Churches in 1969, Hands On Hartford has been committed to feeding, clothing, housing, and caring for Hartford's most vulnerable residents, all with the helping hands of countless generous donors, volunteers and collaborative community partnerships. 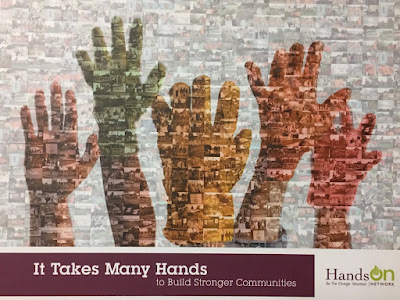 Mark your calendars for Thursday, October 24, 2019, from 5:30 pm to 9:00 pm at the Hartford Marriott Downtown to celebrate Hands On Hartford's 50th anniversary. Details about sponsorships are posted at the following links: Sponsorship Package and Sponsorship Form. Tickets for the celebration will be available soon - contact kshafer@handsonhartford.org for more information. To learn more about Hands On Hartford's fifty year impact, I recently met with Hands On Hartford Board Chair Rev. Donna Manocchio and Executive Director Barbara Shaw for lunch at The Café at Fifty-Five. It's a café with a cause in its third year of operation serving up many new HOH opportunities for community engagement. Located at 55 Bartholomew Avenue in Hartford's Parkville neighborhood, the Café is HOH's mission-driven restaurant offering healthy, everything-tastes-good selections for breakfast, snacks, and lunch, including specialty crepes and a full coffee-tea-smoothie menu. And what makes frequenting this bright, welcoming eatery even more nourishing is that the Café's proceeds feed directly into HOH's revenue stream supporting its many services to people in need throughout Hartford. To make this happen the Café employs people committed to overcoming employment barriers, engages volunteers as kitchen team members, and offers a pay-for-a-neighbor program to help bring together people from all backgrounds and means to enjoy food and camaraderie together. Additionally, the Café's licensed commercial kitchen is in high demand for shared use membership. Currently, thirty-two qualified entrepreneurs and organizations schedule time 24/7 for their food preparation operations. And topping it all off in the spirit of good neighborship, its convenient and comfortable community spaces are available to the public for meetings, conferences, or social events. Crepes are a Café specialty. During lunch, where my Sweet Chili Asian Slaw Wrap with grilled chicken proved a delicious introduction to the Café's offerings, Rev. Donna and Barbara recounted one success story after another explaining how each program helps realize HOH's "commitment to increasing food security and nutrition, improving health, and providing housing" by engaging volunteers and connecting communities. Barbara summarized HOH's mission in just six words, "serving neighbors, engaging volunteers, and connecting communities. " Following in the path of the Café's success a new initiative to provide much-needed affordable housing is on the table for 2019, the construction of thirty affordable rental apartments. In a 2015 initiative to consolidate its scattered site operation under one roof, HOH purchased a vacant building (formerly home to the Spaghetti Warehouse, and then Trout Brook Brewery & Pub), and an adjacent abandoned circa 1912 coal powered energy plant. With Fifty-Five Bartholomew Avenue now housing its community center and café, HOH has turned its attention to renovating the power plant into affordable housing. Twenty-three one-bedroom units and seven efficiencies are planned. Four units will be designated for disabled homeless people, with the remaining available as affordable rentals for people with incomes between 30 - 80% of local average median income (AMI). With a groundbreaking expected later this year, apartment occupancy is planned for mid to late 2021. The new units are certain to give a quality of life boost to this corner of Hartford's historic Parkville neighborhood. Throughout its fifty year history of fostering collaborative community engagement, Hands On Hartford has provided hope for the homeless, nourishment for the hungry, and aid for the ailing. To fully appreciate the scope of HOH's services, all one needs to do is checkout its website, which is replete with information about its programs, services, and opportunities to put your helping hands to work. HOH's seven broad-based programs, as noted below with direct website links (red text), encompass all of HOH's essential community services. MANNA food programs provide basic needs to thousands of individuals in Hartford each year. Through Community Meals, Community Pantry & Neighborhood Services, and its Backpack Nutrition Program, HOH provides food and other supportive services to those in need. always has been at the core of HOH's mission. to ensure they have food each weekend. In addition to its planned new thirty unit apartment building, HOH Housing provides safe and affordable supportive housing and related support services for individuals and families with serious health issues (including those living with HIV/AIDS), both on site and throughout the Hartford area. Through its Community Engagement program HOH involves the public by engaging volunteers in the following ways: serving lunch at its soup kitchen, helping in its food pantry, organizing customized day-of-service projects, and hosting team building service immersion programs, including HOH's unique Dash for a Difference events. The Faces of Homelessness Speakers’ Bureau travels throughout Connecticut (and beyond) to share personal experiences of homelessness, dispel myths, educate audiences on the causes of homelessness, and encourage others to get involved in making positive changes in the community. Groups or organizations are encouraged to host a speaking event or get their feet-on-the-street by engaging with Faces of Homelessness speakers in a walking tour on the streets of Hartford, which includes a visit to a local shelter, to learn about the challenges people face when experiencing homelessness. As previously highlighted, the Café is a mission-based restaurant at HOH's Center for Community offering an excellent menu with low prices, and a pay-it-forward option so that all who enter may enjoy the Café. You can support Hands On Hartford by having Caterers Who Care, HOH's mission-based catering service, custom prepare and deliver breakfast, lunch or dinner for your next meeting or event at your offices or off-site location, including one of the beautifully restored meeting rooms in HOH's community center. qualified entrepreneurs and organizations schedule time for their food preparation operations. Through annual memberships, HOH offers 24/7 scheduled use of its well equipped, licensed commercial kitchen to qualified food operators, such as food truck vendors, specialty catering services, and small bakeries supplying local markets. Hands On Hartford's fifty year history of turning caring into action has affected thousands of lives by creating paths to better futures for people in need. As helping hands and advocates gather to celebrate HOH's fiftieth year in October, may they join their hands in thanks and shout a cheer for the next fifty! 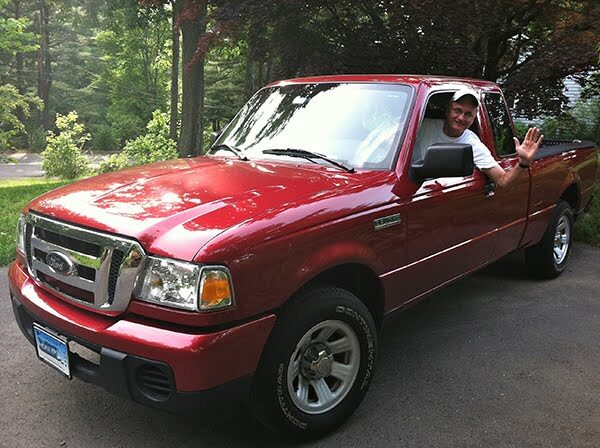 Photos and images courtesy of Hands On Hartford, and by Don Shaw, Jr. Program and mission description texts courtesy of Hands On Hartford.